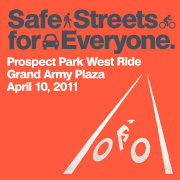 Families and friends of the new Prospect Park West will be gathering at Grand Army Plaza at 10:30 a.m and getting some cool free t-shirts. Starting at 11 a.m. we’ll be riding (and walking) the entire length of the bike path to the Bartel-Pritchard entrance of Prospect Park at 15th Street. At the end of the ride there will be cupcakes from Blue Sky Bakery and more from our bike shop sponsors Bicycle Habitat and Ride Brooklyn. RSVP at the “We Ride the Lanes” Facebook page (which has been acting a little balky, so try again in ten minutes if you run into problems). First you removed a lane of empty asphalt from our beautiful street, and replaced it with a bike lane. Where will it all end? Haven’t we suffered enough? This is yet another example of radical bike lane radicals tipping off cyclists to inflate DOT counts. Marty Markowitz was right! They must be shipping in people from Copenhagen because no one in Brooklyn supports this horror show of a death trap! Yeah, I got yelled at by some people in a Subaru while I was taking pictures of the ride from the pedestrian island. “We hate the bike lane–this used to be such a beautiful street.” Sorry children and families–you’re ruining the view. Also: down with puppies and kittens. Would You and Your Kids Bike on PPW Without Physical Separation?